In recent weeks we’ve looked closely at the Waterford Steam Navigation Company and their river based service. The feedback has been very positive, many contacting me to remark on how vibrant and busy the rivers were, and how important they were for transportation and trade. Its a theme that I have tried hard to showcase down the years. This week in a somewhat related post I wanted to complement a previous guest blog by Leslie Dowley featuring the work boats of the Suir but talking about those boats on the River Barrow, the Barrow Navigation Company and a specific incident at Cheekpoint in 1864 highlighting the trade. The Barrow Navigation Company was founded in 1792 (I did read a newspaper report dated 1790 stating its formation) and it purpose initially was to canalise the river to make it navigable for boats capable of carrying up to 40 tons. They managed the river and canals which was funded through raising share capital at the outset and afterwards by tolls on lock gates etc. 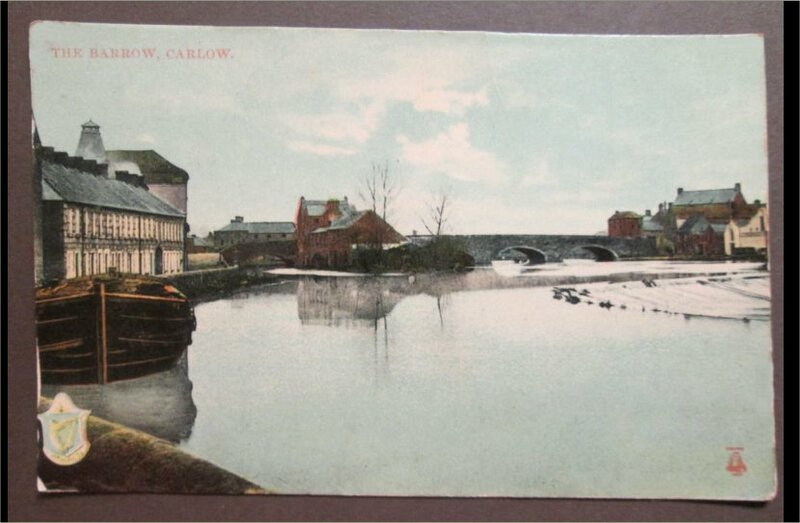 Their primary focus at the outset appears to have been the river between Athy in Kildare and St Mullins, Carlow, the point at which the Barrow becomes tidal. These flat bottomed barge boats worked the tides where appropriate using oar power and poles, but a square sail was also carried and used when conditions were favourable. I would imagine they could also be hauled by men or beasts or any other means once the freight got through. The work of these boats and their handlers flourished until the coming of the railways. The boats themselves would have travelled along the length of the Barrow calling to New Ross and of course carrying freight to Waterford. As the farm produce of the area had a ready market in both towns, this level of trade was obvious. Pigs traveled as far away as Tullow in Carlow for the pig buyers of Waterford and there was a ready market for the return journey of imported goods that came to Waterford or New Ross from abroad. The Irish Waterways History gives a very interesting account of the numbers of boats and horses involved in the business in the late 19th C.
The deeper waters of the lower Barrow and Suir were nothing new to these boatmen so perhaps an incident recorded in 1863 at Cheekpoint, is all the more surprising as a consequence. The Barrow Navigation Company’s screw steamer tug Louisa of 30 tons with six men aboard departed Waterford on January 15th 1863 with two lighters (effectively barges), one either side. The lighter on the port bow was laden with wheat, Indian corn and new rope. The opposite lighter had 35 ton of coal. The destination was the tidal reach of the barrow, St Mullins. The Louisa got under way at 3am on a Friday morning in drizzling rain on an ebb tide, an hour from low water. (An excellent time of tide, ebb to the meeting of the three sisters and a flood tide up the Barrow). As the tug was expecting a regular steamer service sailing into port from Milford Haven a watch was posted and although she had no mast or rigging, lights were placed on a beam across her cook house for navigation purposes. The steamer was seen just as they approached Cheekpoint under Snow Hill. Coming upriver against the Louisa was the SS City of Paris. Owned by Messrs. Ford and Jackson of Neyland, South Wales, the steamer had a regular sailing between Waterford and Milford Haven. Rounding Cheekpoint that fateful morning the watch spotted a white light by Snowhill and as no other lights were spotted assumed that it was a ship at anchor and kept of their course which would take them well outside on the Waterford shore. The Louisa of course was not at anchor but steaming steadily to beat the tide and gain the Barrow. Both vessels kept their courses and too late the City of Paris realised that it was not a ship at anchor and that her course was bearing down. It would later be revealed in court that neither vessel ported on time and that there was no effort on the steamer to reverse engines or indeed slow her speed. In the resulting collision one of the lighters was totally lost, the other partially damaged. The Louisa limped back to Waterford with a damaged bow and rudder, her remaining lighter half sunk. It would appear the City of Waterford was relatively undamaged. In a time honoured fashion the matter would end up in court, the ruling of which were appealed and counter argued. So much so that I’m not 100% sure how it all transpired but the initial ruling did favour the City of Paris finding the lights of the Louisa to be insufficient for navigation. Given the competition they were facing, I’m sure the company could ill afford the loss of her cargo. But they endured. In 1894 the Barrow Navigation Company merged with the Grand Canal Company, probably as a means of sharing costs and competing against the railways. Ironically this new company was subsumed into Córas Iompair Éireann in 1950. CIE at the time was the umbrella for all manner of transport. However, you will see no mention of the canals or the river freight on their modern website. 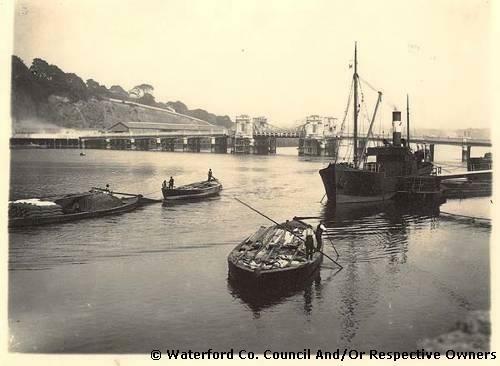 I publish a maritime blog about Waterford harbours maritime heritage each Friday. 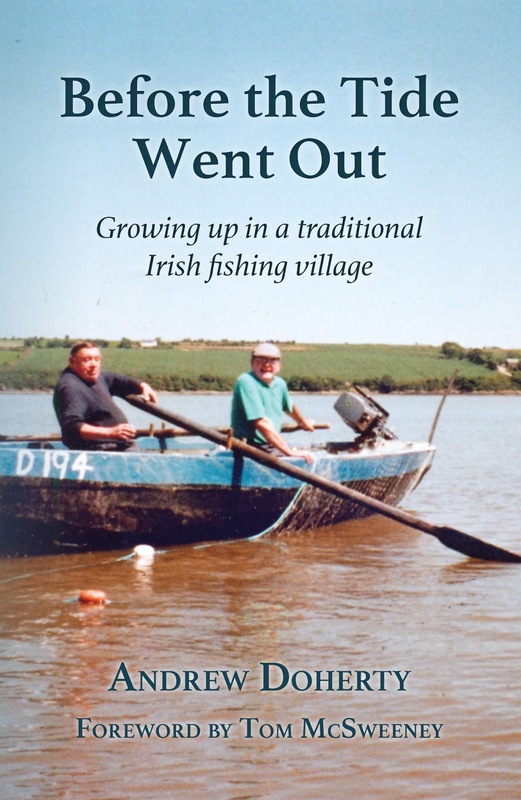 My book on growing up in a fishing village is now published. Last week we looked at the river services operated by the Waterford Steamship Company. This week I wanted to look at the work of one particular ship the Paddle Steamer Ida. 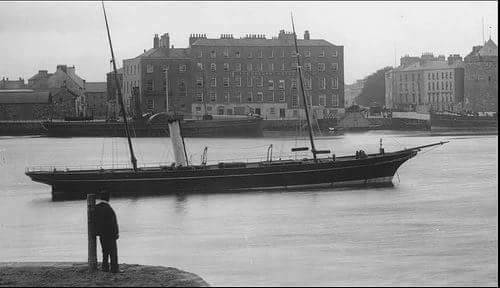 The Ida made her maiden voyage on Friday 31st January 1868 accompanied by the PS Shamrock , making it in 1hr 10 mins , both vessels getting a terrific reception when they reached the New Ross quays. She would be a constant sight on the Suir and Barrow for the next 37 years. (2) The steamers took freight, agriculture produce and passengers each way. The Ida departed New Ross at 8.15am each morning (Mon-Sat) making stops as required at quaysides along the way. Once in Waterford the Ida and her sister ship the PS Vandeleur could be assigned to various tasks in the port, towage, maintenance works and indeed salvage and rescue missions for example the steamers featured in the wreck of the SS Hansa in 1899. I’d imagine there was many a fisherman or boatman could thank these ships for a tow into town or up the Ross river against the tides, saving them from an agonising row. The daily services ran Monday to Saturday but summer Sundays were used for special event trips, one of which started me on this quest to learn more. As I said last week Christy Doherty told me years back of memories of older folk of the Sunday outings, memories of which can still be found in newspaper searches of the time. Bill Irish quotes one such account: “I have very pleasant memories of the shilling trips return every Sunday by steamer from Waterford to Dunmore East and the splendid tea for eightpence at Galgeys or Shipseys Hotel at Dunmore. These trips were the best value that have ever been offered to Waterford residents. The boats the Ida and Vandeleur left about mid-day or 3pm on alternate Sundays. We had three hours in Dunmore and reached Waterford at 10pm” (3) As lovely as it sounds, it would appear to be very costly for ordinary folk. But Christy Doherty did tell me that the special event trips called to all the quaysides and landing posts in the harbour and that a trip to Duncannon could be had for a few pennies and it cost nothing to walk the beach at Duncannon. He also mentioned their roles in transport to and from regattas and events such as horse racing on Duncannon beach. There were many episodes associated with the river service that I have come across. But for sheer madness, this piece sent on by my good friend and heritage ally Frank Murphy must take the biscuit. On Saturday evening July 23rd 1870 the Ida departed her normal berth at the hulk (The Duncannon Hulk I presume based on the events mentioned) on the quay at 4pm. She proceeded down the Suir. Opposite the Mall a drunken passenger jumped onto the railings and hurled himself into the river in an apparent suicide attempt. The Ida immediately stopped her engines and the crew tried to effect a rescue. The gentlemen was struggling in the water, fully clothed and with his boots on. However he didn’t seem minded to accept the crews help. The Clerk of the Waterford Petty Sessions, Mr PF Hanrahan was rowing by in a small boat and came close to the man offering him an oar. He was met with abuse and turning on his back, the ‘drowning man’ proceeded to kick water and practically over turn Hanrahans craft. A boatman in a prong met a similar fate. A dock worker named Kelly had stripped on the quay and dived in to attempt a rescue also, however he met with an uncooperative client. Kelly was picked up by the prong and the two men then managed to overpower and haul the ‘drowning man’ aboard. In the melee that ensued Kelly ended up knocking the gentleman out with a punch who was then rowed ashore where he was arrested on the spot. So many dramas, so many journeys, so many memories. 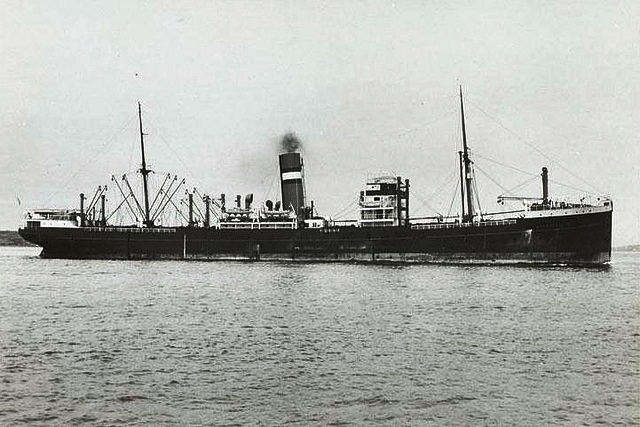 The Ida last sailed on the route in 1905. 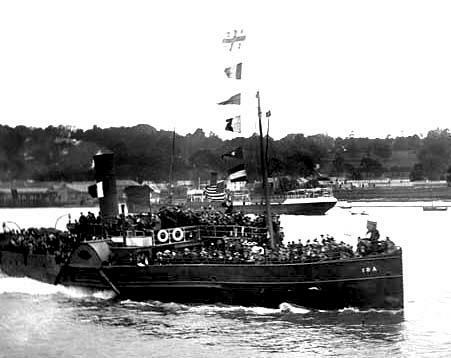 I’m not yet sure when she last steamed down the harbour, but it took her to Bristol where she was broken up at Clevedon Pill in 1908. My thanks to Frank Murphy, Pat Murphy Cheekpoint and Andy Kelly for their assistance with this piece. As a child in Cheekpoint I was told that in the past I could have travelled to Waterford by paddle steamer. Christy Doherty RIP, one of the old school fishermen related stories to me of the paddle steamers calling to Cheekpoint quay, picking up passengers and heading down to Dunmore East for a regatta or Duncannon for a day on the beach. As a child I never really knew what to make of such stories. I suppose I regarded them with some skepticism as we were so used to hearing yarns and tall stories that it was often impossible to tell one from the other. It was further complicated by the way the older guys tended to collude with each other, so going from one to the other, they could often embellish a yarn rather than correct it. So in time to come I was fascinated to learn the truth of the river service, the ships that travelled it and the vibrancy that was the rivers in what I personally consider a golden age. PS Vandeleur at the Duncannon hulk in the city. Paul O Farrell collection. 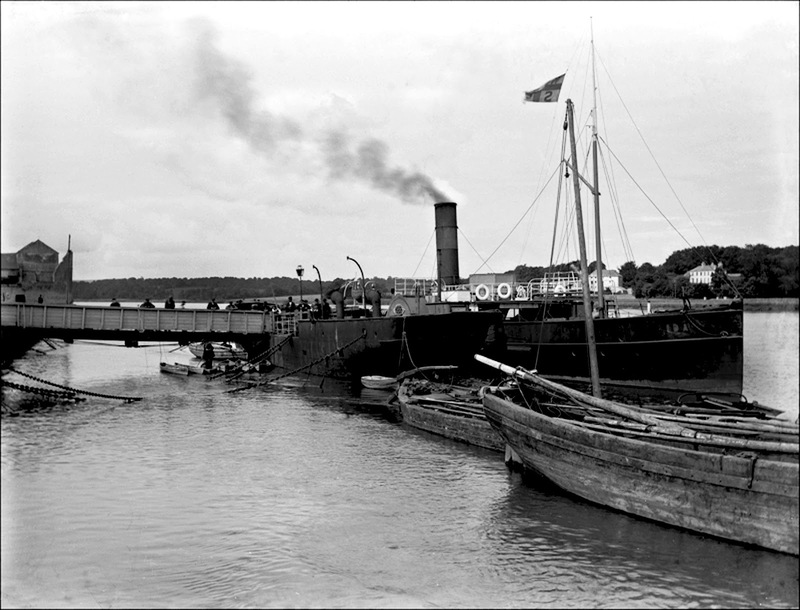 The river service originated with the Waterford Commercial Steam Navigation Company which was formed in 1836 to provide cross channel steamship services. 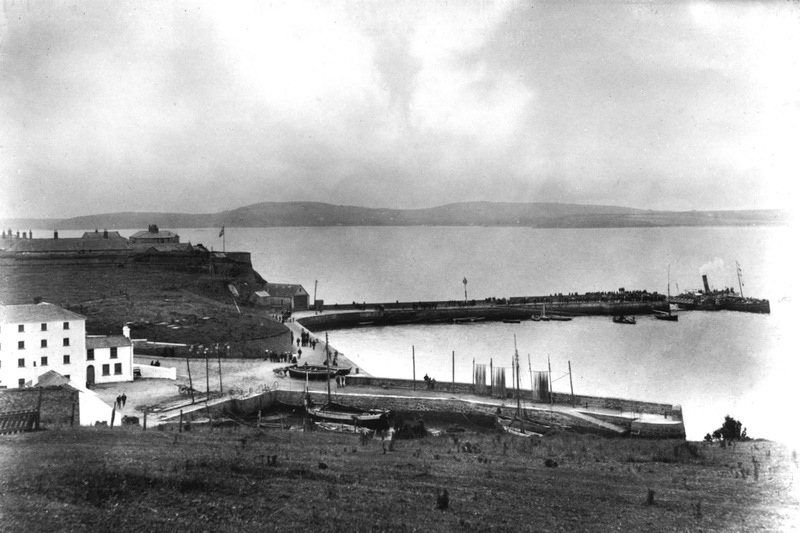 In 1837 a river service was initiated, providing links between the city and both New Ross and Duncannon. Two new paddle steamers were built. The Shamrock 135 tons was built in 1836 in Glasgow, the Duncannon 200 tons was launched in the John Laird yard of Birkenhead in 1837. Shamrock leaves Ross 8.45am arriving at 10am. Fare: Cabin 2 Shillings. Deck 1 Shilling 3 pence. 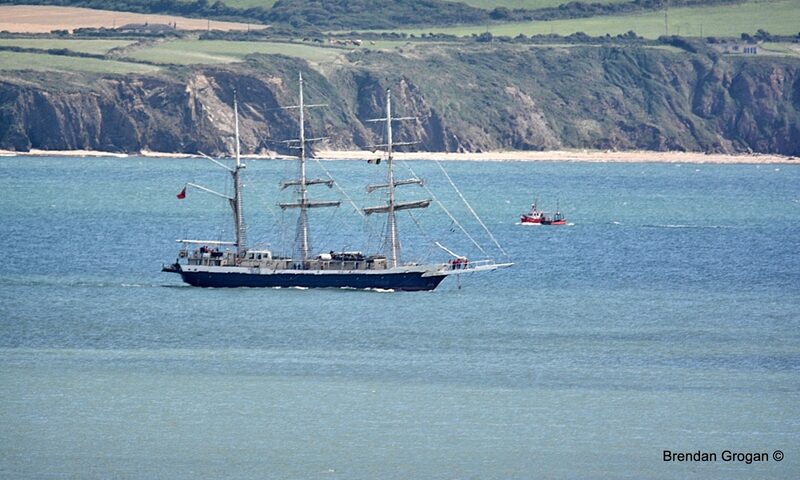 Leaves Waterford for Ballyhack and Duncannon daily at 4pm. 3pm in winter. The PS Duncannon ran until 1861, and when she needed a break for repairs etc a relief steamer the PS Taff was used. She was replaced by the PS Tintern which operated up until the 1870’s and was subsequently replaced by the PS Vandeleur. The Tintern was then used as a relief vessel. The Vandeleur was built in the Neptune iron works of Waterford (Park Road) in 1866 for the Shannon estuary, and where she served until her return to Waterford. 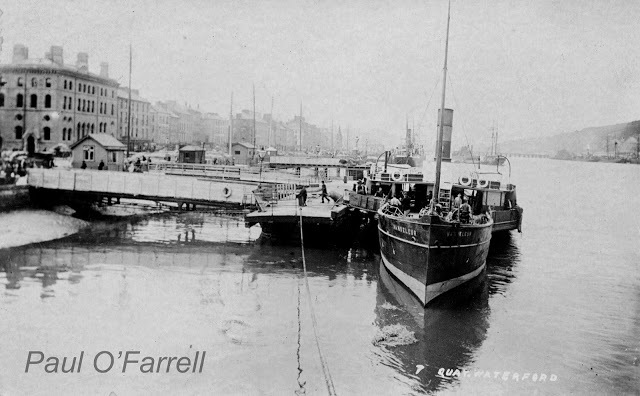 She was originally constructed as a partner vessel to the PS Rosa, a ship that was also to feature on the river service of Waterford. One other ship I am aware of was the Repealer, a ship that has featured on the blog previously. She sailed the Waterford New Ross route in 1842, but possibly in short lived competition rather than as a relief boat. Foreground is steam yacht Maritana with PS Rosa and PS Ida berthed on the city quays. All three vessels were built at the Neptune Iron works. Andy Kelly collection. The following year 1867 the neptune turned out another paddle steamer which went onto the New Ross route, the PS Ida. It appears that the Ida replaced the Shamrock, but another ship mentioned on the route was the PS Maid of Erin. The Ida went into service on 31st Jan 1868 making her sailing to Waterford in one hour and ten minutes. She was 149 feet long by 19 feet with a 9 foot draught. The PS Ida gave 37 years of loyal service. She last sailed in 1905. The end of the river service came with the undermining of their freight and passenger service by the railways. The Ida was made redundant in 1905. 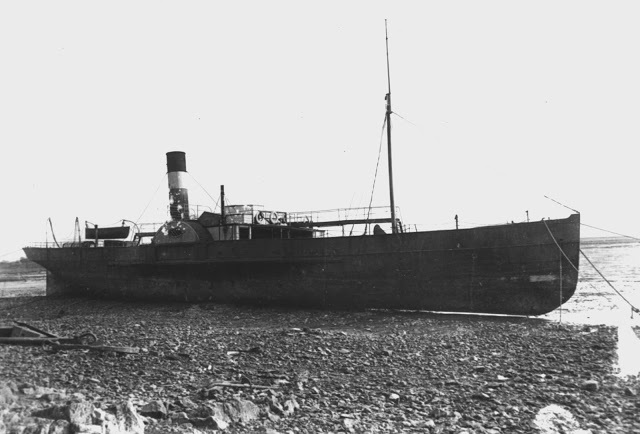 The Vandeleur actually stopped on the Duncannon route in May 1893 and was broken up in 1908. At the time of writing I’m not sure when the actual service stopped, but I understand the Duncannon service persevered into the first world war era. Next week I hope to look at a few incidents associated with the ships including an amazing ten person rescue on the waterford quays. An indulgence I know, but surely I deserve that from time to time. All the details contained in this mornings blog come either from my own notes or specifically from the work of Bill Irish. Also thanks to Andy Kelly for his ongoing support and Paul O’Farrell. Their willingness to share images is much appreciated. When the 42 man crew of the Dutch owned SS Beemsterdijk departed Greenock for Cardiff in January 1941 none of them could have known that all but three would ever see their families again. Those three fortunate men that survived had the keen eyes of the men in the Brownstown LOP and the prompt action of the crew of the Dunmore East Lifeboat to thank for their salvation. The SS Beemsterdijk departed the Clyde for bunkers in Cardiff in January 1941. It was during WWII and ships faced a threat of submarine attack or sea mines. The cargo ship had an international crew aboard and was sailing with a new degaussing system to offset the threat of magnetic mines. However the system seems to have impeded the ships compass and it is thought that the ship lost its way. On Sunday January 26th the ship struck a mine and was abandoned, all the crew getting safely away. An SOS had been sent and a reply received confirming a rescue was imminent. After an hour a party went back aboard the ship as she was staying upright in the water. Following and examination all the crew returned and the lifeboats were hauled aboard. They waited on deck all Sunday and through the night with eyes on the horizon for the rescue that never came. By the morning of Monday the ship had sunk very deeply and the captain decided to abandon ship again. The lifeboats were just away when the ship sunk and because of the suction all hands were thrown into the water. Annie Blanche Smith. At Waterford 4th April 1953. Robert Shorthall Collection. Of the men’s fate thereafter I could find no more. They were finally decided to be well enough to travel in late February, being removed to the Waterford County & City Infirmary for follow up treatment. (5) The Waterford Standard of the following day has an interview with both Van t’Hoff and Stanley Gillard in the Sailors Home in Henrietta St, where they are under the care of Mr and Mrs Marno. Both men are fulsome in their praise for their rescuers and the kindness shown to them in Dunmore and Waterford. Young Gillard is keen to get back to sea. (6) Perhaps the older Van t’Hoff is more careful of what he wishes for! (1) Waterford Standard. Saturday Feb 8th 1941. p 1 An article featuring an interview with Arthur Wescott Pitt who gave a description of the incident based on talking to the three survivors. * McCarthys was later known as the Ocean and is now known as the Three Sisters. Thanks to David Carroll for the information. Back in 1941 , after a long recovery period Willem van’t Hoff and Peter Schrage both served on other ships and survived the war. Willem van ‘t Hoff received further leave and treatment at Cape town SA. During the rest of the war he served on ten ships or more. I contacted his daughter. She told me that after the war, as an engineer, he had his career in the Holland America Line serving on various ships. In 1966 he ended his career being the main engineer on board the ss Rotterdam, which now proudly is national heritage as a floating hotel / museum / event in Rotterdam Harbour. Ironically he died shortly after retirement and before sailing, having been presented with a free trip for both him and his wife to New York. In stead his wife and daughter could make this trip. After recovery Peter Schrage also served on many ships, being torpedoed in 1944 while on board the ss Bodegraven near West Africa. He survived again! After the war he got married, had his family and sailed the waters of Amsterdam Harbour. So I was told by his closest daughter. In 1953 he went to the rescue of the victims when the dikes in the province of Zeeland gave way to enormous flooding. Stanley William Gillard, at the time only 17 years old, had soon recovered from his injuries and was, back in England, able to identify the bodies of some crew being washed ashore near St. Davids’s in Wales. I contacted one of his sons, who was only two years old when his father died in 1954. From hearsay he gathered his father also served on more ships. He then was shipwrecked and for 6 days adrift at sea and suffered frostbite. Until just before his death in 1954 Stanley was working for a die casting firm X raying the castings for defects. His ambition was to run his own fishing boat out of one of the channel ports and set his own wet fish business up. Many thanks to John for sharing this with us.